A couple weeks ago, I was heading to Galveston to scout for a portrait session that I had booked when I noticed a lot of lightning off in the distance. I pulled my car off the freeway near a marsh where I hoped to get a few nice lightning bolts; but, alas, nothing. Just for the record, I was not so stupid as to stand outside and try to get the shot of lightning. Rather, I took the “chicken” way out—I stayed in my car and hopped for the best. I wanted the photo to depict the mood that I felt while watching the storm unfold in front of me. I thought that black and white would do that best. Camera settings: Nikon D3, Nikon 28-70mm f/2.8 shot at 36mm, ISO 200, f/16 and 1/125th of a second with various strobes triggered remotely. Photoshop—used nik Silver Efex Pro to convert photo to black and white. I really like the dark brooding feel of this shot. I like the movement in the water. I also like the different areas of dark and light throughout the photo, which to me gives it depth. Really nice job with this one. I can just image the lightning going off. It was probably an interesting sight. How about painting in some lighting for the rest of us? Definitely a moody shot. 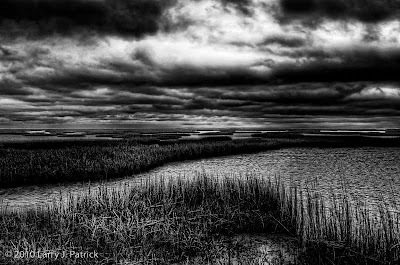 I have tried several times to shoot this marsh area and have never been happy with what I got. I have even thought of bringing a ladder to get a viewpoint to show the islands of grasses better. This brooding, contrasty black and white is not an edit I would ever have thought of, and it makes a very dramatic image. I like your composition with the wave of grasses in the foreground and the line of another area of grass leading you off into the distance. And what a fantastic sky. Dramatic, and intense --- wonderful! Somewhat unusual composition with the brightest part of the image being at the center top of the photo. But, even with that, your eye moves easily throughout the photo. Here I think breaking the rules has helped make this a stronger photo. Nice. Great sky. Maybe a little too dark for me. Your camera position is perfect. Great shot. I love the way the shape of the grass and cloud is rhymed. Nice work. Would like to hear how you used your flashes. This photo has what everyone strives to achieve in landscapes, a feeling of three dimension. The light on the weeds in the foreground provide a solid anchor within the photo. Of course, the sky is the story. The sky is dramatic but I believe the way the sky and the reef seem to reflect each other is what makes the photo inviting. I find myself looking deeper and deeper into the photo. Like this one a lot. Not impressed with it. Too dark, too broody. Larry, great composition. Moody and very nice! The B&W really makes this pop. I've been with Cindi when she commented on this area. You have really captured it nicely!! Congrats! !